One defining characteristic of the Beaglier is its happy-go-lucky, sweet nature and are well known for their lively charisma. They are bright, curious and friendly dogs that are easy going and sociable since both of its parents bear these characteristics. Although, even as adults they look like puppies, they are remarkably intelligent and easily trained. Beagliers are affectionate, calm, and outgoing. They are very affectionate with their families and when mature, will still tolerate some rough play from children. They make good watchdogs and will bark to alert their family of strangers or strange sounds. While most Beagliers inherit some of the Beagle’s hunting abilities, they have a diminished inclination to follow a scent trail. Beagliers love the company of other dogs. Beagliers get along well with other animals in the household (ie. Cats, birds and rabbits) but they need to be introduced to the other pets while still puppies. Beagliers are easygoing and relaxed dogs by nature, thanks to the influence of the Cavalier King Charles Spaniel that probably has the most laid back personalities of all the breeds. However Beagliers love to join in with family activities and outings. This includes playing games inside the home or activities outside the home, such as running, walking and days out to the park etc. They adapt well to new environments such as when taken on family holidays. They do not stress about being away from their normal surroundings while in the company of their family members. In fact they love to be taken for walks to new places they can explore. Like any breed these adaptable dogs do require some form of daily exercise to keep them out of mischief. This is important to keep their minds active and stimulated. Adult Beagliers are happy to laze about when given the opportunity making them suitable for homes with a small yard, but they will enjoy and benefit from a walk, especially Beagliers living in apartments and units. They are just as comfortable playing outside with a younger, active family or spending time on the couch with the family watching TV. Yes, Beagliers do watch television if that is what the rest of the family is doing! 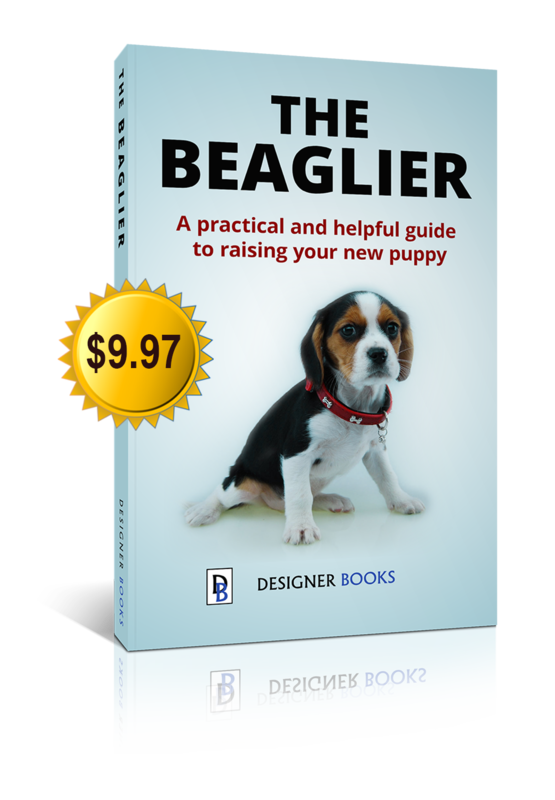 Many families with children choose to adopt a Beaglier after the recommendation of friends and family who already own them. Many other families have grown up with Beagles or other similar dogs and want a dog with an activity level that is a bit more toned down. There is no central body that actively promotes Beagliers or places any large scale commercial advertising to promote them. Yet every year their popularity continues to rise due to word of mouth from the many happy families who have made a Beaglier part of their family. Beagliers also come highly recommended by veterinarians and other dog professionals as a family pet due to their gentle disposition around children and robustness. They are a breed that are very tolerant of children’s antics and will usually put up with most of the annoying antics of children (dressing them up, being wheeled around in carts, etc) and then try to sneak off when they get the chance. They are not a snappy breed, but they are living creatures, and like all of us, have their limits on what they will put up with. Young children need to be supervised while playing with any dog and especially while the dog is young and fragile. Young dogs are still developing in both mind and body and bad experiences with kids at a young age can have lasting effects. It is vital to educate children on when and how to handle dogs appropriately to avoid injury to either one and to prevent your dog from developing avoidance behaviours around children that harass them. Overall, this breed is often chosen for the purpose of being a playmate that the family can grow up with. Beagliers are a naturally social breed who seem to get on well with other dogs. They have Beagle heritage and as such take the bonds of being in a pack very seriously. This applies to not only their human pack but other dogs as well. This makes them very easy to socialise with other dogs. It also helps that they are not large or intimidating to other dogs or to their owners, making finding playmates at a dog park easy. Not many people are afraid of Beagliers and owners of other dogs at the dog park wont feel as though your Beaglier is a danger to their dog. The owners of larger and intimidating dog breeds, such as Rottweilers, can find it hard to find playmates for their dogs to socialise with as their owners may fear the larger dog may hurt their own dogs, even if the larger dogs are friendly. If you are bringing home a new Beaglier to a home with a dog or dogs that are already established, then take care to make the transition smooth. It is easier to introduce a puppy into a home with established dogs, compared to introducing an adult dog. The established dogs rarely see a new puppy as a threat or challenge to their own position in the family pack. Beaglier puppies with their easy going nature will normally act as a little shadow to the older dog and make the older dog feel as though they are not at the bottom of the pack. Make sure you lavish attention on the older dog to help them feel important and prevent them feeling left out since the arrival of the new puppy. One of the fears of new Beaglier owners with other pet animals at home is that the Beagle part of their Beaglier will take over when they see other animals and hunt the other animals. While it is true that they will still follow their nose to some degree, Beagliers get along very well with other animals. This is especially true if the Beaglier is introduced to other animals while still very young. If you are adopting an adult Beaglier, check with the previous owner as to whether it has lived with other animals in the past. Introducing an adult Beaglier to other animal species that they have never encountered before is more difficult than with a puppy. It will take a greater effort but with time, a harmonious relationship can be achieved. Thanks to cartoons, new Beaglier owners with cats at home often fear that their Beaglier will bully the cat but, in reality, the opposite is most often the case. Cats are territorial animals and will usually be the ones to set the rules about how much interaction, as well as what type of interaction, they will have with the dog. While many cats are friendly to, or at least tolerant of, a new puppy and will get along well with them, most will not be shy to give your Beaglier puppy a swipe with their sharp claws. This makes supervision between the two a must until you can trust them together. This supervision is the same for other pets you may have, from rabbits to birds, but you need to supervise to make sure the other animals are protected from the Beaglier puppy, who might consider it too tempting to chase them around the house like a living toy. Almost all dogs, regardless of breed, have some level of prey drive that compels them to chase anything that moves. Living animal are no exception to this, and, their antics while running away seem irresistible to a dog without any training to the contrary. With a bit of common sense and early supervision, Beagliers will blend in to any home with established pets very quickly to be part of the extended family of people and animals.